Review: In a distant galaxy there is a space colony looking for a planet. Leaded by a princess with special mental abilities they are finally able to find it. On this planet they meet a young man who has been left there as a child and managed to survive on his own. Suddenly they get attacked by an alien race but this mysterious boy manages to save them as there is more behind him than meets the eye. This Sci-Fi fantasy story has to offer lots of mecha-action, psy-powers, old space myths and maybe even some romance. Review: Shiratori Kuu is a pretty but rather shy high school girl. She often has the same dream of a beautiful prince asking her to come along with him. Unexpectedly this prince in fact appears in front of her as a new transfer student and just like in her dream he asks her to come along with him. She also meets a mysterious and beautiful girl with golden hair, who seems to have some connection to that prince. While Kuu still don’t quite get what’s going on, she gets involved in their battles and reveals her own special powers. Kyoushirou to Towa no Sora has many similarities to the Kannazuki no Miko anime. However, the fighting and mecha animation is much better and fairly unique compared to other mecha anime shows. Still, some people might think that a lot of the characters are over-stylized with prince and princess themes. At this point the plot still has great potential, but might as well fail for being plain and too cliché. Review: In a distant future when new engines make it possible to travel close to the speed of light, the human race started exploring and inhabiting the universe. In the course of that, humanity was split into 2 powers, the Union and Deague, who have been at a state of war for a long time now, while the battlefront is expanding constantly. Ralph Viereck is a successful Union squadron commander, who is sent on a mission 130 light years away leaving his sister Sara behind. She promises to go after him and soon joins Grapera Space Armed Soldier Academy to become a Strain pilot. She works hard to maintain her top results always thinking of her brother. One day the academy is suddenly attacked by Deague. Her friends get killed by a traitor’s Strain and Sara follows its pilot as he breaks into a secret research laboratory and kidnaps a mysterious girl. When she confronts him she can’t believe her eyes. It’s her Brother Ralph and he hasn’t only changed on the outside, but on the inside too. He attacks fighters, students and Sara without any mercy. Review: Innocent Venus takes place in an apocalyptic setting in 2010 AD. Lots of Hyper Hurricanes formed simultaneous across the globe. Billions of people were killed, counties destroyed and economic and military balance disrupted. The world map changed dramatically and mankind entered a new era. A ruling class was established (Logos). Logos are rich and live in new rebuild district with advanced technology and economy. Outside of those cities there live poor people (Revenus) in slums under bad conditions. The gap between rich and poor became larger and there is a war about to break out between those 2 classes. Review: Simoun takes place in a fantasy world, where all children are born as girls. When they become 15 they can go to the “spring” and decide to become adult woman or man. 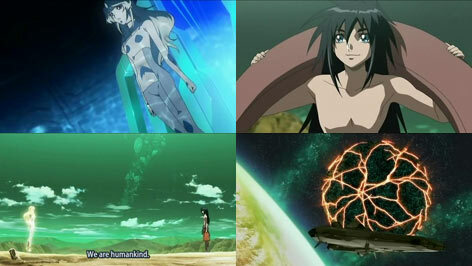 The main-characters live in a country of advanced technology. Simoun, special airplanes that can only be operated by girls, are flown by priestess girls to honour the gods. However, this country is in war with a much lower advanced country, who intend to steal their engine technology, because their current engines poison their air. Now the priestesses are using the simoun as war machines and some decided they won’t go to the “spring” until the war is over.